E-safety is essential for ensuring children stay safe online. In this section you will find information on how to report an e-Satefy concern, as well as links to e-safety tips, videos and games. If you feel uncomfortable by something you have seen on the internet or when using another kind of technology please report the problem. You can do this by telling someone! Tell your mum, dad or carer if you are at home. In school you can tell any adult. They will tell the e-Safety leader who will sort the problem for you. Remember the five SMART steps when using the internet safely. You can report an e-Safety issue using the CEOP link (see links below). This will take you to the relevant phone number and email address that you will need in order to report a problem. Alternatively, we are always happy to help at school with an e-Safety issue. Should you or your child wish to report a problem, please speak to your child's class teacher, who will then notify an e-Safety leader. The issue will then be dealt with and monitored. Thinkuknow The latest information on how to use technology safely. Use the age related links to help your child stay safe online. CEOP - Internet Safety Report any concerns regarding internet safety by using this link. 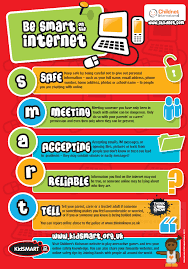 E-Safety E-safety for parents and carers. Paws - Internet safety Internet safety tips. Cbbc - Stay Safe Links for children. Stay safe online with CBBC and Horrible Histories. Think U Know - Top Tips Top tips for 5- 7 year olds.